Metaphysical Guidance, Classes, and Workshops in Central Texas and Beyond! What Happens in a Reading? 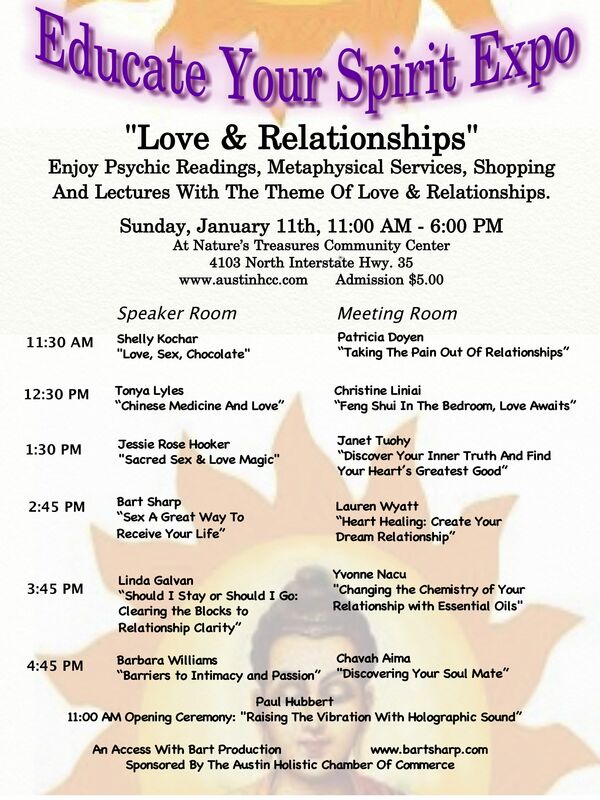 Sunday, January 11th: Readings & “Feng Shui in the Bedroom: Love Awaits”! Please join me for a wonderful day of psychic medium readings, energy work, shopping, lectures, and workshops at the Educate Your Spirit Expo: Love and Relationships located at Nature’s Treasures on Sunday, January 11th form 11am-6pm. My talk/workshop “Feng Shui in the Bedroom: Love Awaits,” will give you fun, easy tips to bring me romance into your life — for singles and couples. Purchase a 20 minute reading (or longer) and I’ll refund the $5 admission fee for the Expo. Educate Your spirit Expo at Nature’s Treasures – See you there! This entry was posted in Events and tagged Austin, central texas, Christine, feng shui, love, medium, Nature's Treasures, oracle, pet psychic, psychic, relationships, tarot on January 7, 2015 by christinethepsychic.